Street “Lord Bajron”, Universitary Hospital of Trauma (UHT), building nr.1, 1026 Tirana, Albania. 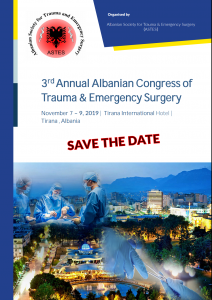 ALBANIAN SOCIETY FOR TRAUMA & EMERGENCY SURGERY (ASTES) is an albanian legal person, founded as Society according to the Albanian Law no. 8788, issued the seventh of May of the year two-thousand and one (7.5.2001) concerning the non-profit associations and the provisions of the Albanian Civil Code, and operates in accordance with the laws mentioned above, this Statute and any other Law in power. The Registered Office of the Society is Street “Lord Bajron”,Universitary Hospital of Trauma (UHT), building nr.1, 1026 Tirana, Albania. The Society with the decision of the Founder in accordance with article 13 of this Statute could displace her Registered Office or create an operative office in another location in the Republic of Albania. The Society could open branches and representing offices anywhere in and out the territory of the Republic of Albania, with the prior approval of the decision of the Founder in accordance with article 13. The Society will have her logo, symbol and stamp. The stamp will contain the name and the symbol of the Society. The executive body of the Society decides for the type of the logos and stamps that will be used on projects, from branches and representing offices or in any other events of the Society . The Society aims education in scientific basis by including when needed, allocation at organisations assigned as free organisations according to section 501 (c) (3) of the Internal Revenue Code. Aim of the Society is to provide high technology support and managing abilities to restructure health care, promote and support the positive developments and the creation and encouragement of development models in different fields of social life through the initiation, management, implementation or support of specific projects, concepts and practices in the respective fields in accordance with the organization’s values. •Encouraging, supporting and implementing various activities and events within the scope of the Society in the field of health care, social, spiritual, cultural and other social issues. •Creation and administration of projects or other social structures, as a branch or not, for the implementation of various development programs in the fields of medicine, education at all levels, health care to fulfill the purpose of the Society. •Promote, support and implement measures to create an effective system of psychological assistance to traumatized people, as well as emergency assistance in cases of natural disasters. •Taking appropriate measures and carry out the operations necessary for the creation and procurement of funds necessary to carry out different programs and activities. •Providing necessary support to activities and programs of domestic or foreign societies or legal or physical persons. •Promoting the purpose and activities of the Society in all media portals. •Asset management to fulfill the purpose of the Society. •Monitoring and evaluation of projects and programs for achieving with quality the objectives of the Society. •Providing and practical implementation of new concepts and practices by the Society itself or through its projects or programs, in areas covered by the scope of the Society. •Offering practical support and services in all aspects necessary for the projects, programs or organizations established by the Society in meeting with her the goals. •Offering and creating opportunities or different platforms and creating or setting up advisory groups for the discussion and development of policies or strategies for the development of areas which are covered by the aims of the Society. •Any other activity that is thought to be reasonable and that fits best and in the public interest, provided or not the “object of activity” and that is not expressly prohibited by law from the Albanian state. For activities listed in the object of activity and when required by the Albanian legislation the Society is subject to permit or licensing. For the avoidance of any interpretation otherwise, the Society has no economic benefit purpose and performs all activities, its organization and management in accordance with this Statute and the Albanian legislation in force that regulates the activity of non-profit organizations. The duration of the Society is for an indefinite period. The Society may be dissolved, joined or transformed at any time in accordance with the Founding Act, this Statute and other legislation in power. For the realization of its purpose and objectives, the Society establishes and maintains relationships with individuals, organizations and other institutions, within and outside the country and has the right to join national and international organizations in accordance with this Statute. Society’s charter capital is 100,000 (one hundred thousand) leke. The Society has the right to open a bank account in any bank in Albania or abroad. The Society provides its financial resources from donations in kind and in cash, funds, grants from physical persons or legal entities, public or private, domestic or foreign, as well as income from activities that develops in accordance with her object of activity and the management of assets owned or in another form of real legal administration of the Society. Financial relations, the mutual rights and obligations with donors are realized in accordance with the relevant agreements. The Society provides income only to achieve the purpose and object of the activity, for which it is created, as well as for the management and maintenance of its wealth. Distribution of every kind of benefit derived from any source, and distribution of any material or financial profits arising from the incomes of the Society is prohibited for any member of the governing bodies of the Society, and for every employee of the Society, except in cases when it comes to liabilities in the form of salaries, fees, royalties or reimbursement arising from employment contracts or similar contracts, or for reimbursement of costs incurred on behalf of the Society. The Society, created and registered as a non-profit organization,is organized and administered in accordance with the Founding Act, this Statute and the Albanian legislation applicable to non-profit organizations. To achieve its purpose and objectives and when required by law, the Society may request and is entitled to be equipped with the relevant licenses or permits to competent authorities in accordance with this Statute and the Albanian legislation in force. The Chairman of the Society. The General Assembly is the supreme organ of the Society. It consists of all members of Society. The Assembly, its activities, including meetings, are chaired by the chairman of the Assembly and in his absence by the deputy chairman of the Assembly. The Chairman and Deputy Chairman of the Assembly, are elected by the members represented at the General Assembly. The mandate of the Chairman and Deputy Chairman is 3 years until the General Assembly meeting. g)as well as any other rights recognized by the law or this Statute which are not left in the hand of any other organs of the Socity. h)approval of the election and appointment of the President of the Society with the proposal of membership of the Society. The Assembly can start internal and external controls to determine whether the activity of the Society is in accordance with law and the provisions of this Statute or not. Controls are initiated by the Chairman of the Assembly or at the request of 1/3 of its members. Ordinary meeting of the Assembly shall be held not less than once a year. However, between two ordinary meetings can be convened the extraordinary meeting of the General Assembly when requested by the Board of the Society or 1/5 of its members. The notification for the extraordinary meeting shall contain the exact place, time of development, agenda and should be communicated to members at least 7 days before. Every member has the right to request in writing to the President to 3 (three) days before the meeting to add to the agenda issues, or to submit written questions to be discussed at this meeting. Assembly decisions are taken by secret ballot with a simple majority vote. The meeting should be attended by more than half of the members of the Society. If this majority is not reached, the metting should be repeated no later than 7 days from the first meeting and makes decisions by majority of the members present. There are exceptions in cases established by law for which the approval of a majority of all members of the Assembly is needed. Members who have not paid membership dues do not have the right of voting. At the meeting a writen report which is signed by the Chairman is held. Board of the Society consists of eight (8) members who are elected by majority vote by the General Assembly from the list of members of the Society. The Board, its activities, including meetings, is chaired by the Chairman of the Board and in his absence the Deputy Chairman of the Board, who are elected with over 50% of the votes of the members of the Board. The mandate of the Chairman of the Board and Deputy Chairman of the Board is 1 (one) year, with the right re-election. The mandate of Board members is 1 (one) year, with the right of re-election. If a board member resigns, he may be substituted with a member who was sixth in the list of names for the Board to vote in the last Assembly. Board meetings are held at the headquarters of the Society. The Board meets at least once every six (6) months. Notice of the meeting is made at least one month before. Meetings are chaired by the Chairman of the Board and in his absence by the Deputy Chairman of the Board. The Board makes valid decisions when the meeting is attended by more than half of the members. Decisions are taken by a simple majority of votes of those present members.In case of equal number of votes during the voting, the vote of the Chairman, and in his absence the Deputy Chairman, will be crucial. At each meeting, a writen report is held and signed by the Chairman or Deputy Chairman of the Board. Board members are dismissed from their post when they are absent without justification three consecutive meetings or when they lose the right of a member of the Society. a)to examine and define work plans, projects in which will be applied and focused the attention of the Society etc. m)to determine the value of membership dues and submit them for approval to the General Assembly. n)Chairman of the Board acts on behalf of the Society attorney in representing its interests to third parties. Each member of the Board of the Socity can be attributed tracking certain issues. Executive management of daily operations of the Society is performed by the Chairman of the Society. Chairman of the Society is appointed and dismissed by the General Assembly every three years with the right of relection. a) Manages the overall daily operations of the Society and its branches and representative offices, prepares reports and programs for the Society and its branches or its representative offices and presents programs or such reports for approval to the Board of the Society. b) Organizes the work for implementation of the work plan, designs projects and submit them for approval to the Board of the Society. c) Applying for funds in certain donors for projects approved by the Board. d) The Chairman of the Society and Chairman of the Board act without proxy on behalf of the Society, represent its interests before state bodies and before trade companies and non-profit organizations, and submit them prior for approval to the Board of the Society. e) Authorizes payments for staff, fees, contractual obligations and all expenses for the operational functioning of the Society, after prior approval by the Board of the Society. f) Open bank accounts for the Society. The Supervisory Board may authorize in writing the Chairman of the Society for assuming powers that are not provided for by this Statute, without exceeding the powers of superior bodies and those that the law allows. Chairman of the Society can participate in executive bodies of other organizations only with the consent in writing of the Board of the Society. Board may dismiss the Chairman of the Society at any time if he does not perform his duty in accordance with the Statute and the powers that have been given. ·Endorse or repeal internal regulations and other organizational acts of the Society, approves changes in the Founding Act and the Statute of the Society. The Founder and each member of the Board may propose amendments to the preceding acts. Decisions on changes in the Founding Act and the Statute deal with 2/3 of the members appointed to the Board. ·Approves the budget of the Society, financial statements (balance sheet, statements of income and expenses) and approves them in the General Assembly. ·Approves the criteria and limits of representation of the Society in relation to third parties. ·Approves the criteria for accepting donations of any kind and the principles for establishing and maintaining relationships with donors. ·Approves the organizational structure of the Society as well as descriptions of responsibilities and work of the employees of the Society. ·Approves the structure of salaries for the Society’s employees and the criteria for their promotion. ·Establishes advisory committees or appoints individual consultant in accordance with Article 10.2 and 10.3 of this Statute. ·Decides on the destination of wealth of the Society when the Society is dissolved. ·Approves the criteria for the administration of the movable or immovable assets of the Society, as well as the conditions for receiving or granting loans. ·Decides the transfer of material or financial assets, movable or immovable, at the Society projects, whether these are registered as separate non- profit organizations. ·Appoints external auditors for independent control of the financial activities of the Society. ·Decides for transformation, splitting or joining of the Society in accordance with the requirements of the legislation in force and of this Statute. These decisions are made by 2/3 of the appointed members of the Board. The Supervisory Board, in accordance with this Statute and with the legislation in force, may decide to examine also other issues, which are not within the competence of the Chairman of the Society. The highest executive body of the Socity is the Chairman of the Society. The Chairman of the Society is appointed by the Assembly for a term of 3 years, with the right to re-election. Chairman of the Society runs everyday activities of the Society, cares for the realization of the interests and objectives of the Society, cares for the implementation of the decisions of the Supervisory Board, and represents the Society in relations with third parties. ·Represents the Society in relation to third parties in accordance with the regulations of the Supervisory Board. ·Proposes organizational structure, responsibility and work descriptions for the staff of the Society. ·Proposes the budget of the Society and submits financial statements to the Board and the General Assembly. ·Proposes the structure and criteria for the promotion of members of the Society. ·Proposes criteria for the management of movable and immovable assets of the Society, as well as conditions for receiving or granting of loans. ·Pursuant to its competence and in accordance with this Statute, may create advisory groups or to appoint a special adviser for the treatment of specific issues. ·It may propose changes in the Founding Act, the Statute, or the Internal Regulations approved by the Supervisory Board, and may issue internal acts concerning the administration and organization of the daily activity of the Society. The Chairman of the Society, in fulfillment of its responsibilities and for the realization of the interests of the Society, may undertake any action necessary, as long as the action/s does/do not conflict with the Albanian legislation in force, with this Statute or any act of Supervisory Board. The Chairman of the Society reports written to the Chairman of the Board every three months especially regarding the progress of the activity and the realization of the objectives of the Society, as well as the main problems encountered during the activity of the Society and relevant solutions. The Chairman of the Society takes part, without the right to vote, in meetings of the Board when this is required by the Chairman of the Board. Chairman of the Society at the time of its creation and registration is Mr. Agron Dogjani. As a rule, the Society is represented in relation to third parties by the Chairman of the Society or by another person in accordance with the criteria and limits of representation provided by a special act of the Chairman of the Society or the Board. The Board has the right to request information regarding the representations under paragraph 1 of this Article, and may consider contractual arrangements for this purpose and decide whether they are developed or not in accordance with this Statute and the Albanian legislation in force. 1.Members of the governing bodies and employees of the Society should in any case avoid conflicts of interest between them and the Society. They should avoid in any case such colludes or agreements which create disadvantage or harm the interests of the Society in favor of any of the above persons or relatives to the above persons. 2.Cases of conflicts of interest and ways of solving them are defined by special act of the Board, in accordance with this Statute and the Albanian legislation in force. 1.The Society may be transformed, split or merged by the Board decision and with the approval of this decision by the Assembly of the Society, and under terms and conditions specified in this Statute and the Albanian legislation in force. 2.The above decision is taken by ¾ vote of not less than ¾ of the members appointed to the Board by not less than ¾ vote of the Assembly. Decision of the Board should provide the relevant reasons for taking such decision, the steps to be followed, time frames and relevant persons who are charged with implementing the decision. 3. The Assembly of the Society decides to approve or not the above decision of the Board. 1.The association can be dissolved voluntarily with the decision of the Assembly. In this case, the Assembly charges the Board for the performance of the relevant actions for the implementation of voluntary dissolution of the Society. This actions include appointment of a liquidator and especially oforganizations that will benefit the Society’s assets after the liquidation. 2.In the case of voluntary distribution the Board appoints one or more liquidators, whose activity is carried out in accordance with this Statute and the Albanian legislation in force. The decision also contains their mass of compensation. 3.After completion of the liquidation process with the approval of the final report of the liquidator, the Board decides on the destination of the remaining assets of the Society. As a rule, these assets will be transferred to organizations which pursue or carry out the same activities comparable to those of the Society. The Board decides on the name of the beneficiary organization or organizations. 4.No member of the Society’s governing bodies and employees or their relatives can claim to have any financial assets of the Society, with the exception of loans provided by them on behalf of the Society. The Society also is not responsible for failure to meet the credit or loan that comes through no fault of Society. 5.Liquidator or liquidators appointed by the Board, respond to the Board for their activity and are required to submit written or oral information regarding activities and certain transactions or actions carried out in connection with the liquidation of the Society. 6.The Society is unregistered in the adequate court and other bodies concerned with the decision of the Board, which also has approved the final report of the liquidator or liquidators, regarding the liquidation of the Society. The above decision also contains the name of the beneficiary organization or organizations in accordance with paragraph 3 of this Article. For everything else that is not predicted in this Statute, the Founding Act or the Internal Regulation of the Society, will be implemented the decisions of the Governing Board, the provisions of the Civil Code and the law “On non-profit organizations” in force. This statute is drafted in four copies and after being read and understood by the initiators was signed by representatives of the attorney appointed by his free will and full consent.